This chapter presents the application of new information technology in education for the training of air traffic controllers (ATCs). Machine learning, multi-criteria decision analysis, and text analysis as the methods of artificial intelligence for ATCs training have been described. 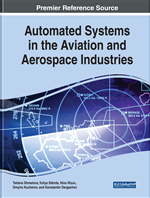 The authors have made an analysis of the International Civil Aviation Organization documents for modern principles of ATCs education. The prototype of the neural network for evaluating the timeliness and correctness of the decision making by ATCs has been developed. The new theoretical and practical tasks for simulation and pre-simulation training have been obtained using expert judgment method. The methodology for sentiment analyzing the airline customers' opinions has been proposed. In addition, the examples of artificial intelligence systems and expert systems by the authors, students and colleagues from National Aviation University, Ukraine and Gdansk University of Technology, Poland have been proposed. Pilots and ATCs are working together for ensuring the safely, economically and efficiently flights of aircrafts (ACs). The pilots in crews are in communication with the ATC. ATCs are responsible for the order of movement of different types of ACs (manned and unmanned ACs, helicopters, etc. Control by the dispatcher includes absolutely all stages of the movement of the AC: from taxing it from the parking lot before take-off to taxiing to the parking lot after landing. That is, in the Air Navigation System (ANS) operates the principle of “dual operator”: the pilot – the ATCs (Figure 1). Actual is the study of the regularities of the activities of both operators and their teams both in the process of fulfilling their professional duties and in social life. The authors present conceptual models of Decision Support Systems (DSS) and Expert Systems (ES) for human-operator (H-O) of ANS, such as ATCs, for training, in-flight emergencies, etc. The authors present Artificial Intelligence Technology and models of ES for H-O education in ANS. Latent Semantic Analysis (LSA): Is a technique in natural language processing, in particular, distributional semantics, of analyzing relationships between a set of documents and the terms they contain by producing a set of concepts related to the documents and terms. Term Frequency-Inverted Document Frequency (TF.IDF): Is a weight measure often used in information retrieval and text mining. This weight is a statistical measure used to evaluate how important a word is to a document in a collection or corpus. Air Navigation System (ANS): Is a complex of organizations, personnel, infrastructure, technical equipment, procedures, rules, and information that is used to provide of airspace users of safe, regular and efficient air navigation service. Artificial Intelligence System (AIS): Was a distributed computing project undertaken by Intelligence Realm, Inc. with the long-term goal of simulating the human brain in real time, complete with artificial consciousness and artificial general intelligence. Communication, Navigation, and Surveillance (CNS): Are the main functions that form the infrastructure for air traffic management, and ensure that air traffic is safe and efficient. Standard Operating Procedure (SOP): Is a set of step-by-step instructions compiled by an organization to help workers carry out complex routine operations. SOPs aim to achieve efficiency, quality output and uniformity of performance while reducing miscommunication and failure to comply with industry regulations. Expert Judgment Method (EJM): Is the procedure for obtaining an assessment of the problem based on the opinion of specialists (experts) for the purpose of subsequent decision making (choice). Decision Making (DM): Is the cognitive process resulting in the selection of a belief or a course of action among several alternative possibilities. International Civil Aviation Organization (ICAO): It codifies the principles and techniques of international air navigation and fosters the planning and development of international air transport to ensure safe and orderly growth. Performance-Based Approach (PBA): Is a decision-making method based on three principles: the strong focus on desired/required results; informed decision making driven by those desired/required results and reliance on facts and data for decision making. The PBA is a way of organizing the performance management process. Human Factor (HF): The term that describes all the many aspects of human performance which interact with their (aviation) environment to influence the outcome of events. These may be related to either the physiological or psychological aspects of human capability, both of which are able to directly affect the way in which the human operator performs in different circumstances. Competency-Based Training (CBT): Training and assessment that are characterized by a performance orientation, emphasis on standards of performance and their measurement and the development of training to the specified performance standards. Flight and Flow Information for a Collaborative Environment (FF-ICE): A product of the ICAO Global ATM Concept that defines information requirements for flight planning, flow management, and trajectory management and aims to be a cornerstone of the performance-based air navigation system. Instructional Systems Design (ISD): Involves a systematic process for the assessment and development of training solutions, designed specifically for the purpose of formal training delivery. There are two widely recognized instructional design models in use today by both educational institutions and corporate training functions. The most traditional is the ADDIE model, of which there are several variations. The second is the agile model, whereby there are several variations, including rapid application development, rapid content development, and the successive approximation model. Knowledge Discovery in Databases (KDD): Is the process of discovering useful knowledge from a collection of data. This widely used data mining technique is a process that includes data preparation and selection, data cleansing, incorporating prior knowledge on data sets and interpreting accurate solutions from the observed results. Potentially Conflict Situation (PCS): A situation in which, subject to the absence of intervention by an air traffic controller, a violation of the separation norms (vertical, lateral, or longitudinal separation between two aircraft do not provide a safe distance between them) will occur after some time. Analysis, Design, Development, Implementation, and Evaluation (ADDIE): Is the generic process traditionally used by instructional designers and training developers. The five phases—analysis, design, development, implementation, and evaluation—represent a dynamic, flexible guideline for building effective training and performance support tools. Air Traffic Management (ATM): The dynamic, integrated management of air traffic and airspace including air traffic services, airspace management, and air traffic flow management—safely, economically, and efficiently—through the provision of facilities and seamless services in collaboration with all parties and involving airborne and ground-based functions. Pre-Simulation (Pre-SIMUL): The practice in the restricted or real time of a part of the skills necessary for the operational task in a possibly unrealistic environment (e.g., 2D aerodrome). Expert system (ES): Is a computer system that emulates the decision-making ability of a human expert. Air Traffic Service (ATS): A generic term meaning variously, flight information service, alerting service, air traffic advisory service, air traffic control service (area control service, approach control service, or aerodrome control service). Radial Basis Function (RBF): Is a term that describes any real valued function whose output depends exclusively on the distance of its input from some origin. Artificial Neural Network (ANN): Is biologically inspired computer program designed to simulate the way in which the human brain processes information. ANN gathers its knowledge by detecting the patterns and relationships in data and learns (or is trained) through experience, not from programming. Human-Operator (H-O): Is the human component in the aviation system (the human subsystem). Air Traffic Controllers (ATCs): Are the coordinators of the movement of aircraft to maintain safe distances between them. Air traffic controllers typically do the following: monitor and direct the movement of aircraft on the ground and in the air; control all ground traffic at airport runways and taxiways; issue landing and takeoff instructions to pilots; transfer control of departing flights to other traffic control centers and accept control of arriving flights; inform pilots about weather, runway closures, and other critical information; alert airport response staff in the event of an aircraft emergency. European Organization for the Safety of Air Navigation (Eurocontrol): Is an international organization working to achieve safe and seamless air traffic management across Europe. Document-Term Matrix (DTM): Is a mathematical matrix that describes the frequency of terms that occur in a collection of documents. In a document-term matrix, rows correspond to documents in the collection and columns correspond to terms. Multi-Criteria Decision Analysis (MCDA): Is a discipline aimed at supporting decision makers who are faced with making numerous and conflicting evaluations. Decision Support System (DSS): Is the interactive computer system intended to support different types of activity during the decision making including poorly-structured and unstructured problems. Ukrainian State Air Traffic Services Enterprise (UkSATSE): Is the organization responsible for providing air traffic service (ATS) across Ukrainian airspace and in the airspace over the Black Sea where the responsibility for ATS is delegated to Ukraine by international agreements. As part of this service, UkSATSE also provides airspace management (ASM), air traffic flow management (ATFM), on-route meteorological services for air navigation (MET), and pre-flight information services (ARO/AIS). Simulation (SIMUL): Provision of knowledge, skills, and attitudes by means of a representation of air traffic responding to any student action as real air traffic. Simulation always includes briefing, tutoring, and debriefing. Multilayer Perceptron Network (MPN): Is a class of feedforward artificial neural network. Collaborative Decision Making (CDM): Is a joint government/industry initiative aimed at improving air traffic flow management through increased information exchange among aviation community stakeholders. System-Wide Information Sharing and Management (SWIM): Is a Federal Aviation Administration advanced technology program designed to facilitate greater sharing of air traffic management system information, such as airport operational status, weather information, flight data, the status of special use airspace, and National Airspace System restrictions. Guided Simulation (GSIMUL): Is extensive interaction between the student and the computer in the form of questions, feedback, comments, instructions, and assessment. This guidance assumes the existence of a theoretical model against which the student can be compared. Machine Learning (ML): Is a class of methods of Artificial Intelligence, whose characteristic feature is not a direct solution to the problem, but learning in the process of applying solutions to many similar tasks. Latent Dirichlet Allocation: ( LDA): Is a generative statistical model that allows sets of observations to be explained by unobserved groups that explain why some parts of the data are similar.